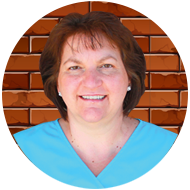 Jane Fleege has been a valuable part of the Langworthy team for 30 years and has been a certified dental assistant for 34 years! The past 25 years have been spent in the front office managing the financial end of the practice and processing insurance. Her willingness to learn new things no matter the difficulty level is what makes Jane one of the most knowledgeable team members we have. If you have a question, chances are Jane knows the answer! Jane enjoys the challenges and obstacles that come with working with insurance and wants to help patients maximize their insurance benefits. Outside of work, she spends time with her family, and enjoys walking and reading.